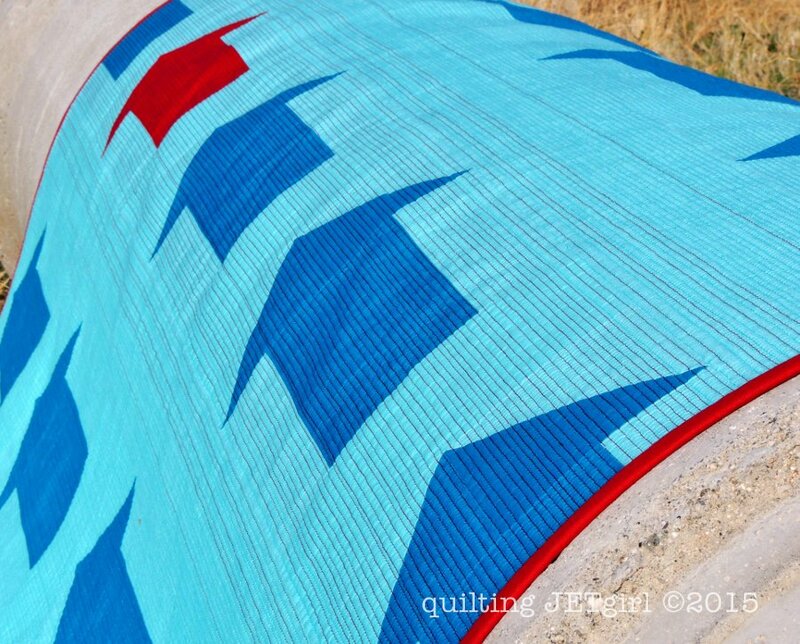 I finished Red Herring, and I am so excited to get to reveal the whole quilt to you today. Well, the wind was as excited as I was yesterday. The photo shoot was a bit of of a challenge, to say the least. 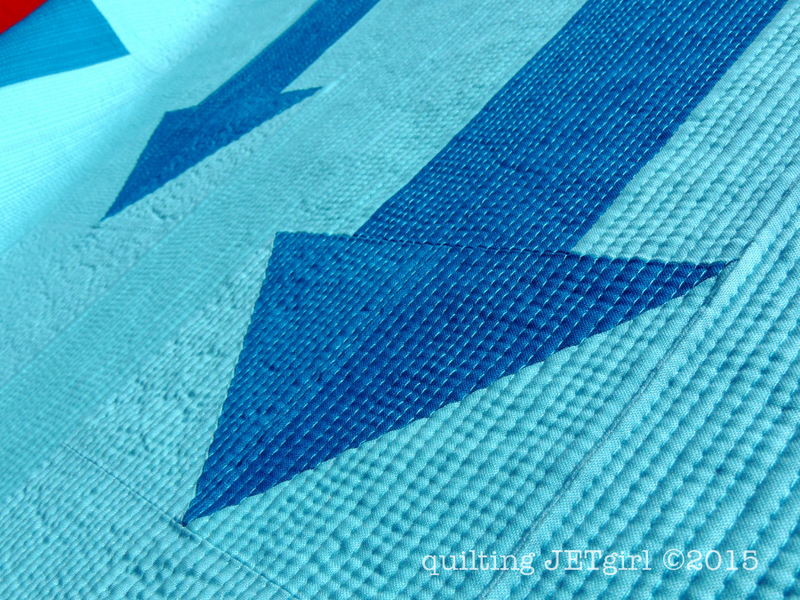 But with the corner flipped up, you can see how beautifully the Kona Bahama Blue (background) and Kona Oasis (arrows) match the Studioe Prisms (in Aqua) backing. 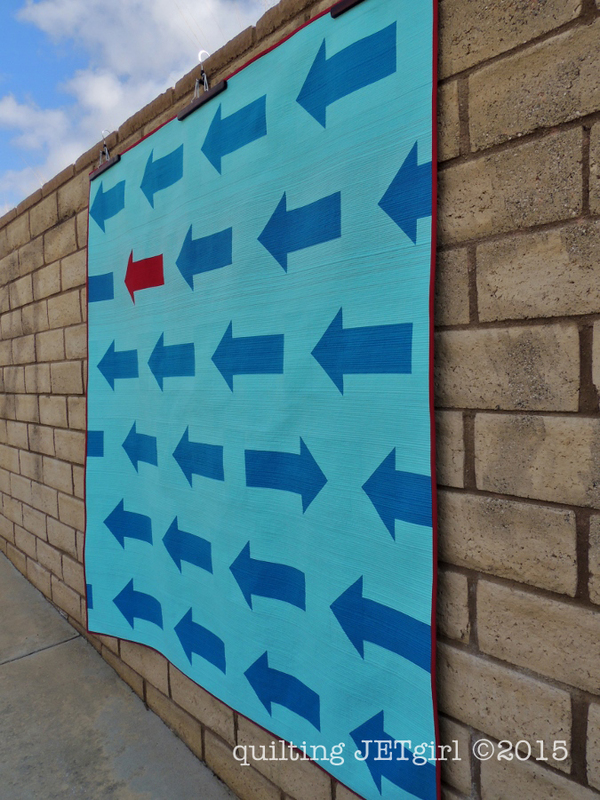 You can also see that I chose to bind the quilt with Kona Ruby, the same as the bright red arrow. 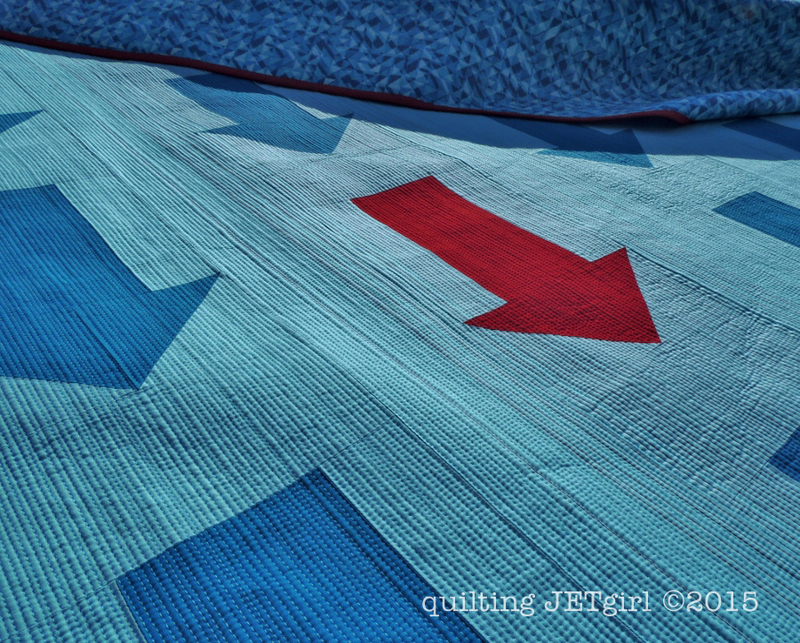 In the sun, the Aurifil #2460 (Dark Carmine Red) that I used along the row with the red arrow really stands out and the Aurifil #5005 (Bright Turquoise) blends in beautifully with the rest of the quilt, with the dense matchstick quilting providing a great texture. 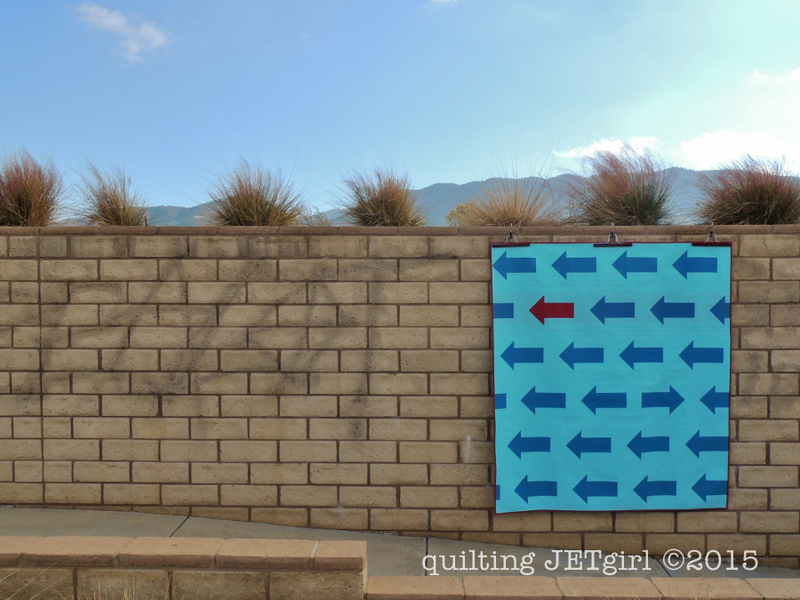 I estimate that I used 1.5 large spools of 50wt Aurifil thread on the quilting alone, or 2,133 yards (1.2 miles)! I had a lot of fun as I was hand stitching the binding to the back of the quilt feeling the texture created from the quilting. So the question is, do all my tricks add up? Does anything else jump out at you? I am not convinced that it is hidden very well, but then again, I know exactly what I am looking for. And it tickles and pleases me so much. 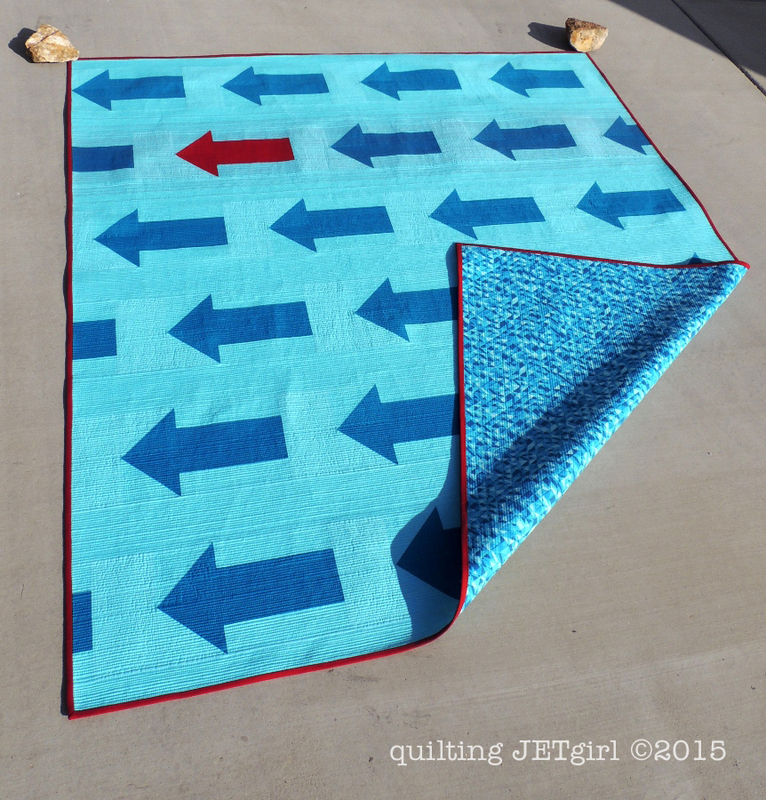 Red Herring, you were a really fun quilt to make! The quilt finished at 62.5-inches by 70-inches. 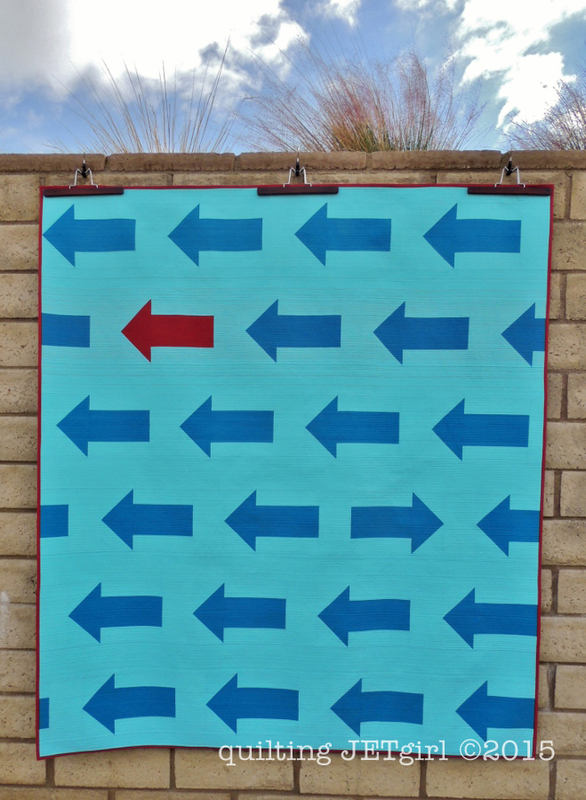 If I were to make the quilt all over again… I would piece the heads of the arrows as flying geese. I was so gung ho to make the quilt I didn’t even pause to consider, I just started with what came to mind first (HSTs)! 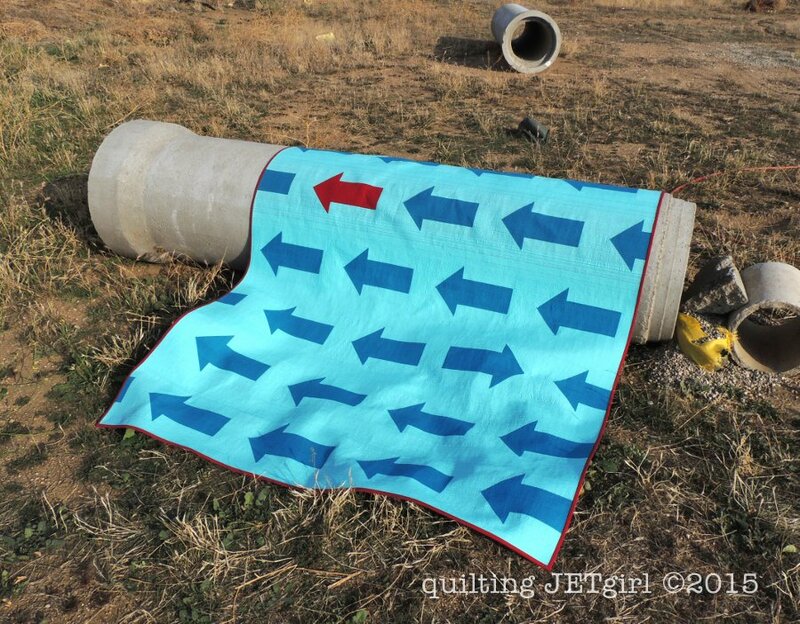 And stay tuned, I plan to put together a quilt pattern for this in the upcoming weeks (if you are interested, let me know as more interest means I’ll dedicate more time to making it happen sooner rather than later!). Linking up with Finish It Friday, Can I Get a Whoop Whoop, and TGIFF.